Work on Untethered iOS 4.3 Jailbreak is Already Underway ! We already know that GreenPois0n kernel based untethered exploit has been closed by Apple, starting from iOS 4.3 Beta 3. Now unless and until someone like Comex or Pod2g comes up with yet another untethered exploit, the iPhone Dev Team has already started working on porting Redsn0w’s Monte jailbreak for iOS 4.3. 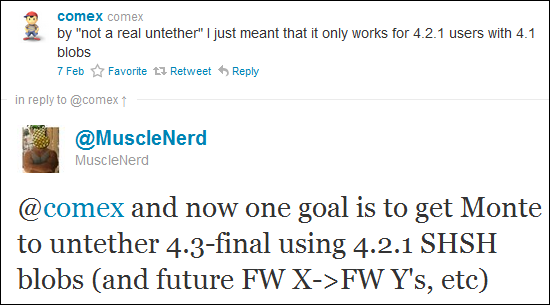 As MuscleNerd points out on Twitter, the aim of the game has to be to get Monte jailbreak to work with iOS 4.3. This is where all those SHSH blobs for 4.1 and 4.2.1 will come in handy folks, so be sure to save them using Cydia or TinyUmbrella, or iSHSHit!